When you install ShiftNav, it will automatically register a new Theme Location called ShiftNav [Main]. This is the theme location that is used in the main instance of ShiftNav that is automatically added to your site when you install the plugin. 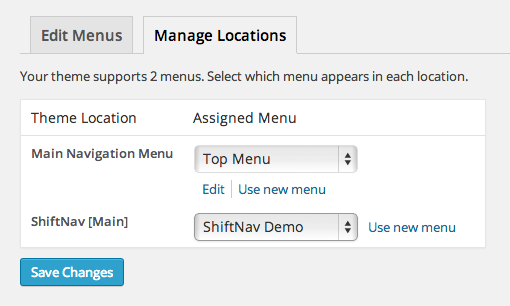 You can assign an existing menu to ShiftNav, or you can create a brand new menu and assign that instead. If you have created an additional ShiftNav Instance with ShiftNav Pro, you can set the menu within the special +tab for that instance. You can either select a theme location to display (the menu will be automatically determined by the menu assigned to that theme location), or you can set a specific menu. Using Theme Locations is more flexible, however if you don’t need that flexibility, setting a specific menu is easier as you can skip setting up special Theme Locations. If you set both, the Display Menu setting will override the Theme Location setting.